The Guardian is a British national daily newspaper which was founded in 1821 as a replacement for the radical local paper Manchester Observer. It forms part of a media group with international online offshoots. Its sister papers also include The Observer and The Guardian Weekly. 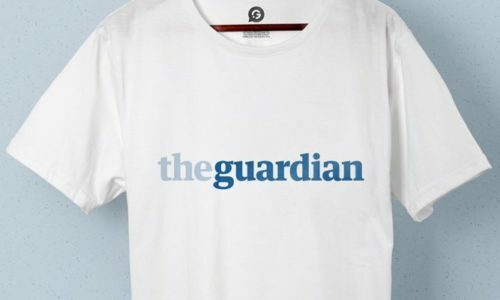 The Guardian contacted Garment Printing as they were in need of 30 printed T-Shirts for upcoming music festivals. The T-Shirts were to be worn by their staff at the events and had to showcase where they were from. We had to ensure that the Guardian brand guidelines were respected at all times and had to ensure that the colour of the print matched the blue in the Guardian’s logo. In order to do this, we had to Pantone match the colour by finding out the Pantone number and matching the colour of the ink to the colour of the logo. As the event was also sponsored by Blackberry, we had to incorporate the Blackberry logo into the printed T-Shirt designs. This meant including their logo on the T-Shirt and also ensuring that the colour scheme for the Blackberry logo matched their brand guidelines as well. The T-Shirts were different sizes which all consisted of the same design. This mean that screen printing was the best technique for the job. This was because it allowed us to create a single screen which could be used to print all 30 of the T-Shirts and meant that we could use our excellent Express Printing services to ensure that all the T-Shirts were printed and delivered in time for the festivals. By using screen printing, it also meant that were able to match the colour of both the Guardian’s and Blackberry’s logos perfectly to ensure that all brand guidelines were met and followed perfectly.